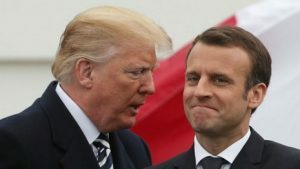 Live on television, watched around the world, French President Macron tried to spoil the most solemn occasion by making disgusting far left comments. On this most respectful day of peace and reconciliation he declared that nationalism was not patriotic but treason. Only elected on the second round of voting by a coalition of left and conservative types to stop Marine Le-Penn of the superb National Front, from being elected President. She would not have made political comments on this 100th anniversary of the terrible 1st World War, but would have maintained the honour and decency of the occasion. Macron, already clearly not up to the job should resign today. Update: Donald Trump has also just issued a similar statement. Tagged British Democrats, britishdemocrats.uk, Macron, Trump, Trump & Macron Remembrance.